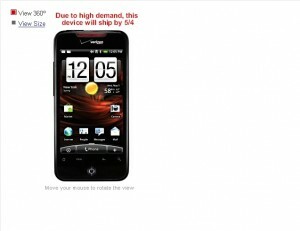 HTC Droid Incredible already sold out on Verizons website. The HTC Droid Incredible is available today from Verizon Wireless. This very impressive handset, which even Google has suggested that Verizon customers buy instead of the Nexus One,has already sold out online. If you going to order the HTC Droid Incredible you going to have to wait till May 4th for the device to be shipped. The Droid Incredible will have a 3.7-inch WVGA AMOLED touch screen, a 8.0 MP camera, Android 2.1,1 GHz Snapdragon processor, 8GB of internal memory, Wi-Fi, GPS, supports up to a 16GB microSD card. The HTC Droid Incredible will be running HTC Sense user interface on top of Android 2.1. The HTC Droid Incredible will feature integrated Google applications such as Gmail & Google Maps. The device will also integrate with Microsoft Exchange and Facebook contacts. The HTC Droid Incredible will cost $199.99 with a two-year contract & $529.99 with out a two-year contract. So will you be getting the HTC Droid Incredible ? Former author of Mobile News Now.